No. 33 overall prospect Alex Reyes will lose his prospect status once he records one out in the Major Leagues. That's assuming he stays healthy, which has been a challenge for the 24-year-old right-hander. He threw only 23 innings in the Minors last season before a lat injury ended his campaign. But 2016 first-round Draft pick Dakota Hudson enjoyed a solid season for Triple-A Memphis, going 13-3 with a 2.50 ERA and a 1.30 WHIP in 19 starts. That earned him his first crack in the Major Leagues, where he excelled out of the bullpen; the right-hander allowed eight earned runs over 27 1/3 frames in 26 relief appearances for St. Louis. Ryan Helsley will look to rebound from an injury-plagued season in which he made 13 starts between Double-A Springfield and Memphis. Right-hander Junior Fernandez possesses a 70-grade fastball, while Jake Woodford, Giovanny Gallegos and Daniel Poncedeleon offer depth that can be tapped by St. Louis this season. A system that once boasted Sixto Sanchez, Philadelphia's pitching depth enables it to crack the top 10, despite sending MLB.com's No. 27 overall prospect to Miami to headline the J.T. Realmuto trade. But Adonis Medina is another powerful right-hander with a 60-grade fastball and is baseball's 77th-ranked prospect after fanning 123 batters over 111 1/3 frames and posting a 4.12 ERA with Class A Advanced Clearwater. The 22-year-old also sports a plus slider and changeup. David Parkinson led the Minors with a 1.45 ERA in the left-hander's first full season between Class A Lakewood and the Threshers. Adding to that depth are lefties who made their big league debuts in 2018. Enyel De Los Santos produced a 10-5, 2.63 ERA showing with Triple-A Lehigh Valley, while Ranger Suarez went 6-3 with a 2.75 ERA between Double-A Reading and Lehigh Valley. JoJo Romero and Cole Irvin shouldn't be too far behind in seeing Major League action either. Spencer Howard impressed in his first full season, striking out 147 over 112 innings with a 3.78 ERA, and the expectation is that the 2017 second-round pick will continue a quick rise through the ranks after showing a big velocity jump toward the end of 2018. With Howard rising up the system and a big arm up top -- and Suarez and De Los Santos already having contributed in the Majors -- the Phillies are in a good spot when it comes to pitchers. Heading into the offseason, Seattle likely would not have made this section of list. But general manager Jerry Dipoto did what Jerry Dipoto does and revamped the top of his farm system by dealing veteran James Paxton to the Yankees for the system's new top prospect in Justus Sheffield (No. 43 overall). He shipped Robinson Cano and Edwin Diaz to the Mets for right-hander and No. 91 overall prospect Justin Dunn. Both moves obviously benefited the M's pitching depth. Sheffield made his Major League debut last season as a reliever after pitching to a 2.48 ERA with 123 strikeouts over 116 innings in the Minors. He's still expected to be a Major League starter in his new organization. Dunn reached Double-A after bouncing back from a down year in the Florida State League and will look to start the season with Double-A Arkansas or Triple-A Tacoma, with the Majors in the not-too-distant future. Adding Logan Gilbert and his four-pitch mix with the 14th overall pick back in June was another big boost here. Right-hander Wyatt Mills impressed in the California League, where he had a 1.91 ERA out of the bullpen and converted 11 of 14 save chances, although he struggled following an August promotion to Arkansas. But the acquisitions of Sheffield and Dunn -- two potentially key rotation pieces down the road -- have the Mariners set up well. A pair of talented southpaws solidify Oakland's spot on the list. Jesus Luzardo last year established himself as the top lefty prospect in the game. The No. 12 overall prospect began his second season in the Minors with Class A Advanced Stockton for three starts before heading to Double-A Midland, where he dominated. In 16 starts, the 21-year-old posted just a 2.29 ERA. He struggled in four starts at Triple-A but was expected to battle for a spot in the big league rotation in Spring Training. Aside from Luzardo, health is a concern in the A's system. A.J. Puk underwent Tommy John surgery less than a year ago, but he's already thrown off a mound and the organization still has high hopes for the game's fifth-ranked lefty. Puk split 2017 -- his first full season in the Minors -- between Stockton, where the 6-foot-7 prospect held hitters in the offensive-minded Cal League to a .196 average and whiffed 98 in 61 frames, and Midland. Right-hander James Kaprielian, who came to Oakland in the Sonny Gray trade with the Yankees in 2017, also is recovering from Tommy John surgery but is expected to pitch this season. Daulton Jefferies has made seven appearances since being drafted 37th overall in 2016 and also is recovering from Tommy John surgery. Grant Holmes is another prospect who can make an impact after injury limited him to two starts last season. Wyatt Marks and Parker Dunshee are 2017 Draft picks who provide depth. Marks spent most of last season with Class A Beloit and made it to Stockton, finishing the year with a 3.30 ERA. Dunshee advanced from Stockton to Midland and was an Organizational All-Star after posting a 2.33 ERA and .205 opponents' batting average at Double-A. If the staff can get -- and stay -- healthy, the A's could find themselves in better shape than this ranking. Entering 2018, perhaps no organization had a more impressive stable of right-handed pitching prospects than the Tigers. Adding Casey Mize with the No. 1 overall pick in the Draft only strengthened that case, even though he made only four appearances for Class A Advanced Lakeland. However, only Matt Manning really took a step forward in his development. The 2016 first-rounder had a 3.29 ERA across three levels and reached Double-A Erie. With Lakeland, he fanned 65 over 51 1/3 innings in nine starts and batters hit .176 against him there. A lat strain kept Franklin Perez from making his season debut until July and he was back on the disabled list three weeks later. The 21-year-old allowed 10 earned runs over 11 1/3 frames in four starts. Beau Burrows persevered through an inconsistent year for Erie, going 10-9 with a 4.10 ERA. Alex Faedo experienced a drop in velocity and scuffled when he was promoted from Lakeland to Erie, with his strikeout numbers low at both levels. Even though the quintet will have plenty to prove in 2019, there's potential among the Tigers' lesser-known prospects. Righty Kyle Funkhouser reached Triple-A Toledo after posting a 3.74 ERA with Erie. Left-hander Matt Hall excelled out of the bullpen for Erie (1.58 ERA in four starts and 23 relief appearances), pitched well in 10 starts for Toledo and eventually made five appearances in the Majors. Last season may have produced question marks for some of the system's pitchers, but a fresh start can have the Tigers' arms back among the top five. Michael Kopech will not pitch in 2019 as he recovers from Tommy John surgery. Right behind him, however, is No. 21 overall prospect Dylan Cease. The right-hander broke out last year after coming to the South Side from the crosstown rival Cubs with slugger Eloy Jimenez in the Jose Quintana trade. Cease went 9-2 with a 2.89 ERA for Class A Advanced Winston-Salem before making his final 10 starts of the season for Double-A Birmingham, where he did not lose a game and allowed 10 earned runs while striking out 78 over 52 1/3 innings. Opponents batted .189 against him, including a .168 mark in the Southern League. Behind Cease is Dane Dunning, MLB.com's No. 80 overall prospect who also climbed from Winston-Salem to Birmingham last year. The right-hander made 15 starts and owned a 2.71 ERA between the two levels, with 100 strikeouts over 86 1/3 frames. Alec Hansen fell out of the top 100 after a down year and is a bounceback candidate. Lefty Kodi Medeiros, a Brewers first-round Draft pick in 2014, came to the organization last July as part of the Joakim Soria swap. Jimmy Lambert followed the Cease-Dunning path of success in jumping from Winston-Salem to Birmingham, with better numbers at Double-A. Spencer Adams offers more immediate rotation help for Chicago, having posted a 3.19 ERA in 15 starts for Triple-A Charlotte. With two studs leading the way and solid depth, the White Sox are worthy of a top five ranking. The third AL West team to appear on the top-10 list, the Astros continued their rise up the rankings after checking in at 10th prior to last season. Forrest Whitley will look to rebound from a 50-game suspension and a trio of stints on the disabled list that limited him to 26 1/3 innings for Double-A Corpus Christi. But as the organization's top prospect and the top pitching prospect in the game (No. 7 overall), the belief is that he can make an impact at Minute Maid Park this year. Josh James did just that in 2018 after beginning the season with the Hooks. From there, the righty made 17 starts for Triple-A Fresno and fanned 133 batters over 92 2/3 innings. The No. 62 overall prospect eventually reached Houston, where he made three starts and three relief appearances and posted a 0.96 WHIP and 2.35 ERA. Southpaw Cionel Perez followed the same path and came out of the bullpen eight times for the Astros after 20 Minor League appearances (73 2/3 innings) last year. No. 81 overall prospect Corbin Martin didn't allow an earned run in four outings for Class A Advanced Buies Creek. With Corpus Christi, the righty posted a 2.97 ERA and 1.09 WHIP to wrap his first full season in the Minors. J.B. Bukauskas has crept back into the top 100 (97th overall) and made starts across five levels once he recovered from an automobile accident that left him with a slipped spinal disk. He ultimately reached Double-A and delivered six scoreless innings for the Hooks in his lone start. From a depth standpoint, Houston can rely on Framber Valdez and Rogelio Armenteros, while Brett Adcock posted a 2.89 ERA in a starter-reliever hybrid role with Buies Creek and Corpus Christi. That depth, along with a quartet of top 100 prospects -- two of whom might be Major League-ready -- gives the Astros the nod at No. 4 on this list. A torn ulnar collateral ligament cost Brent Honeywell the entire 2018 season, but the organization's third-ranked prospect will look to build off his 2017 campaign and keep knocking on the big league door. He should return at some point toTriple-A Durham, where he tossed 123 2/3 innings two years ago. One of the Minors' more intriguing prospects, Brendan McKay will no longer play the field as a two-way player, but he'll still pitch and DH. During his first full pro season in 2018, the lefty threw well for Class A Bowling Green and Class A Advanced Port Charlotte, even though his pitch counts were closely monitored. In six starts for the Hot Rods, MLB.com's No. 24 overall prospect allowed three earned runs. For Port Charlotte, McKay was 3-2 with a 3.21 ERA. There's a growing feeling in the game that his future will be fully on the mound because of his three above-average pitches and good control. The Rays added more pitching through the Draft, selecting Matthew Liberatore -- considered one of the best prep arms in the class - with the No. 16 overall pick last June. Shane Baz was one of the key pieces in the Chris Archer trade, although he's never pitched above Rookie Advanced ball after going in the first round of the 2017 Draft. Shane McClanahan was a 2018 selection (No. 31 overall) and is a lefty who made four appearances after his college season at South Florida. Lefty Anthony Banda reached the Majors last year, but Tommy John surgery will shelve him until late in the season, if he's able to pitch at all. Colin Poche is coming off a career campaign, in which he posted a 0.82 ERA, struck out 110 batters over 66 innings and won the MiLBY Award for Top Relief Pitcher of the Year. The southpaw, acquired from Arizona in May, already is making waves at Spring Training and uses a high spin rate to attack hitters. The wealth of young talent, plus the possibility Honeywell could be a big addition to the Tampa Bay rotation in 2019, means the Rays are well-positioned for now and years to come. Arms on arms on arms. That's what you've heard about the Braves system the last few years. The bad news for NL East foes and everyone else? The talent has finally reached the big leagues. Even worse? Atlanta is replenishing its system with solid arms in the lower levels. 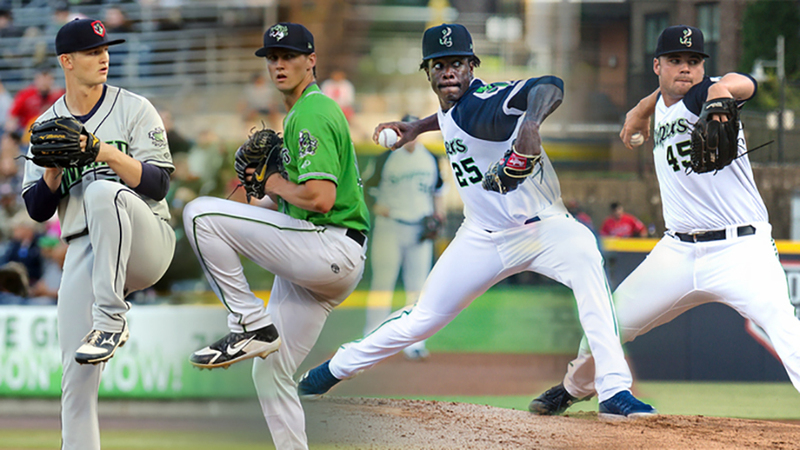 Mike Soroka, Kyle Wright, Touki Toussaint and Bryse Wilson all debuted in the Majors last season. That alone is a healthy stable of pitching depth that will either be a part of the rotation this year or with Triple-A Gwinnett, ready for the callup at a moment's notice. Soroka (No. 24 overall), Wright (30th) and Toussaint (50th) are all former first-rounders who are living up to expectations. Wilson (82nd overall) was a 2016 fourth-rounder who advanced through four levels last year. Right-hander Ian Anderson is another former first-round selection (2016) and was invited to big league camp this year. In 2018, the 32nd overall prospect went 4-7 with a 2.49 ERA and .199 opponents' batting average between Class A Advanced Florida and Double-A Mississippi. Luiz Gohara first made the Majors in 2017, joined Atlanta for nine appearances last year and is part of a stable of lefties that provides the base for the system. The other southpaws are Kolby Allard, who also made his Major League debut last season after posting a 2.72 in 19 starts with the Stripers; Joey Wentz, who made only 16 starts but delievered a 2.28 ERA for Florida; and Kyle Muller, who made it from Class A Rome to Mississippi and went 11-3 with a 3.03 ERA in 25 games. Both Muller and Wentz earned non-roster invitations to Spring Training this year. Further down the system, Huascar Ynoa flashed for Rome and owned a 3.63 ERA before heading to the Florida State League at the end of the season. Tristan Beck and Trey Riley were both college arms drafted in 2018. Freddy Tarnok was taken a year earlier and went 5-5 with a 3.96 ERA for Rome last season. The Braves may have fewer top 100 pitching prospects (five) than the Padres, but it's the proximity to the Majors that makes them boast the Minors' top pitching system.